Zihuatanejo is a cute little fishing village in Mexico. Ixtapa is the resort town next door. Zihuatanejo has kept much of its original charm because the hustle and bustle of the tourist trade is elsewhere. Plus, we were pleasantly surprised to discover that most of the tourists were Mexicans, so even Ixtapa has been spared some of the Americanization we have seen in other resort towns. There were some huge iguanas in the treetops. We looked for iguanas while we waited for the elevator. We had a magnificent view of the beach and the diving pelicans. At night we could see the moon and stars, and almost hear the disco over the sound of the pounding surf. The hotel switched out these cruise-folded towels for our amusement. The bag on the left has pastries! We’re quick to scope out the bakery situation when we go to Mexico. The hotel lobby had some rather silly fountains. There was a ramp but no escalator. But it looks like an escalator from here. Free WIFI in the lobby worked almost all the time! We could upload photos to facebook from here. I knew what the noise was, but it took us a while to locate them. Three peacocks in this cage, and a pair of peafowl (Mom and Dad) were in another one. Capybaras would look cool with tails like this! The tail could go up when we are pouffy! Wait — what are you looking at? Birdbath activity behind me stole the scene. They were having a good time! Water aerobics class with extra super-duper LOUD music! They got a little carried away with the fish theme. These little palm trees are perfect for animals whose fur feels like a coconut. This meal was okay, but the obnoxious American next to us was unforgettable! Mexican waiters can put up with anything. But he did inspire us to collect our own celebratory accessories. We were too lazy to do much exploring. It was, after all, a vacation. FORBBIDEN Swimming, diving or, get into the water, there are crocodiles in the area. We took the bus everywhere. How many capybaras do you see? Zihuatanejo has some great little restaurants. Whoa! that beer is STRONG! the tiny Mexican limes are the best! They even like Canadians there. There are a million little stores in Zihuatanejo. We got some really good stuff! The best part of it all was this little restaurant on the beach. They made it easy to hang around. Not everyone had fun hanging out at the beach. Hey, kid! Keep it down over there! It was also fun to watch the pelicans from the hotel room balcony. Pelicans are kind of crazy. Stacy and SuperCapy! What a team! 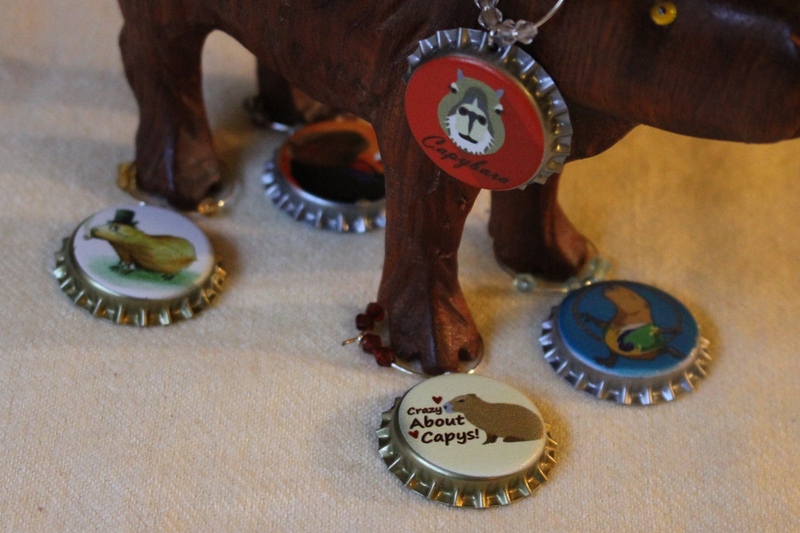 You can purchase your very own SuperCapy here. SuperCapy is the cutest American tourist! Thanks for sharing your vacation pictures! Such a nice Super Capy in a Mexican cap! It looks as good as Su Dungizi in a Tatar cap!! !